Afghanistan gave a spirited performance against former Twenty20 world champions India but dropped four costly chances during a 23-run defeat in their opening World Cup Group A match on Wednesday. Virat Kholi profited from one of the missed chances to score 50 from 39 balls in India's 159 for five. Suresh Raina (38), who added 46 runs for the fourth wicket with Kholi was dropped twice, and Yuvraj Singh was missed once while scoring 18 from 20 deliveries. Yuvraj was playing in his first major tournament after cancer treatment. 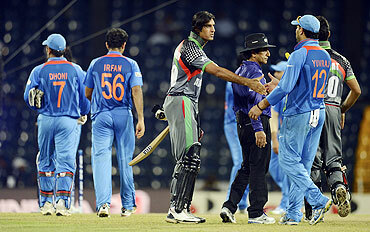 India then bowled out Afghanistan for 136 runs in 19.3 overs with Yuvraj and Lakshmipathy Balaji capturing three wickets each. Afghanistan, who chose to field first, contained India's aggressive top order in the power play with pace bowler Shapoor Zardar removed both Gautam Gambhir (10) and Virender Sehwag (eight) to limit India to 22 for two off 4.1 overs. However, Kohli's partnerships with Yuvraj and Raina helped India post a total that was just out of reach for Afghanistan. Kohli's 50 included four boundaries and two sixes, while Raina struck six fours. Captain Mahendra Singh Dhoni hammered 18 off nine balls at the end of the innings. Afghanistan reached 75 for two after 11.1 overs, but the dismissals of Karim Sadiq (26) and Asghar Stanikzai (6) off consecutive balls by Yuvraj helped turn the tide back to India. Left-arm spinner Yuvraj finished with three for 24. Balaji also captured three wickets but India's primary bowler Zaheer Khan struggled, going for 32 runs without reward off three overs. 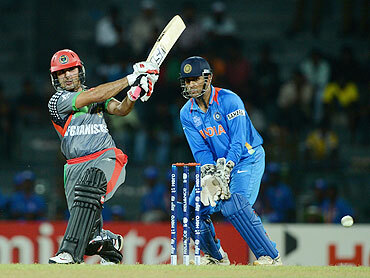 Middle-order batsman Mohammad Nabi top scored for Afghanistan with 31 off 17 balls, including two fours and two sixes. The top three batsman all got decent starts but could not carry on.